Heat 1 inch oil in deep 12-inch skillet over medium-high heat until oil starts to shimmer (about 350°F). Add plantain slices; cook until golden brown and tender. Remove from oil. Flatten the plantains using the bottom of a flat-bottomed glass bottle or a tostonera, if you have one. Return flattened plantains to skillet; cook for 30 seconds on each side or until slightly crisp. Remove from skillet; place in large bowl. Cool slightly. Place plaintains, garlic and 1 cup of the broth in food processor. Process until mixture has the consistency of chunky mashed potatoes, adding broth 1/4 cup at a time. Add salt and pepper; process until mixed. Spoon into serving bowl; garnish with cilantro. Serve immediately. To mellow garlic flavor, sauté in oil just until light golden brown before adding to plantain. Use a handheld potato masher if you do not have a food processor. The beef broth amount depends on the size of the bananas and the desired consistency of the recipe. 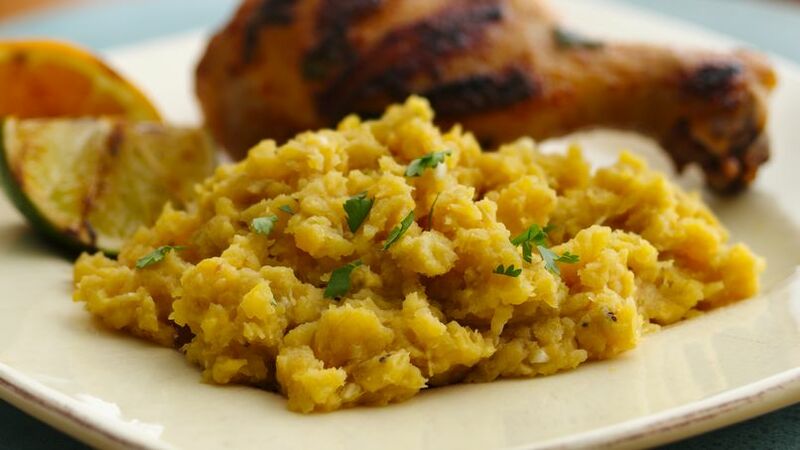 Add something tasty to your family’s Island cuisine night with this tasty mashed plantains side dish – a distinctive meal.